Tom Kovats has lived in the Northern Virginia area his whole life. He's been passionate about music ever since the 5th grade when he started playing musical instruments. Tom and Sound Wave owner Chris Rao have been friends for 25 years, and they would spend countless hours listening to and critiquing music while playing basketball in one another's driveways. Tom's first DJ experience came at Virginia Tech, where he DJ'd at the famous "Zoo" house parties. 12 years later, as DJ TomKat, Tom can be found igniting the Saturday night dance crowd at McCormick and Schmick's in Reston, VA. Tom is also a DJ favorite for entertaining at wedding receptions and private parties. 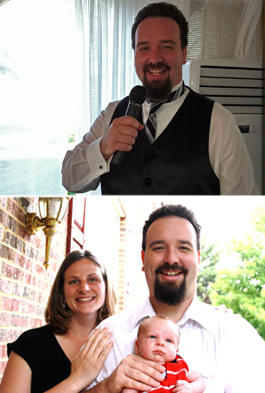 By day, Tom is an IT Consultant, and lives in Fairfax with his wife Diane and their newborn son Edward.